I finally finished. The room reveal I’ve been talking about now for about 6 months is done! 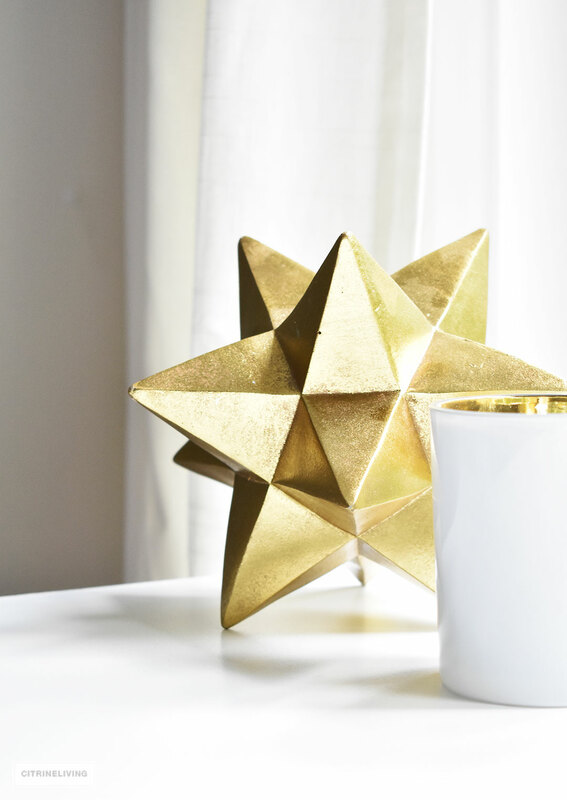 Do you remember when I had found this amazing brass sputnik lighting? It kickstarted yet another bedroom update in our daughter’s room – read all about it here – I think this may be update four or five – this room has seen 3 paint colors and numerous bedding. 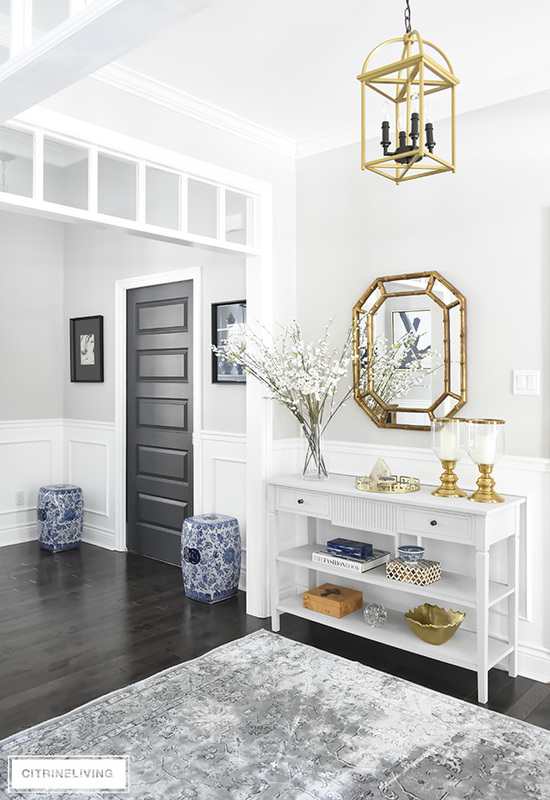 I had just painted this room last year and as soon as it was done, we were ready for a change (see that reveal and the other looks here). Yes, I know that sounds over the top to continuously be updating her room. 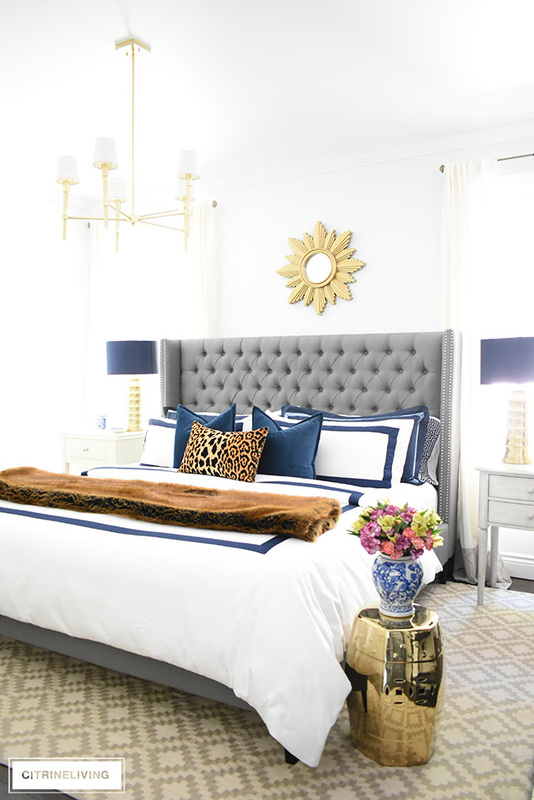 If you know me well however, bedding is something I like to switch out seasonally in our master, and I also like to replace it every couple of years for a fresh look. I keep the cost relatively modest for that reason. You’ll also notice as you scroll down, that only a few things have changed. 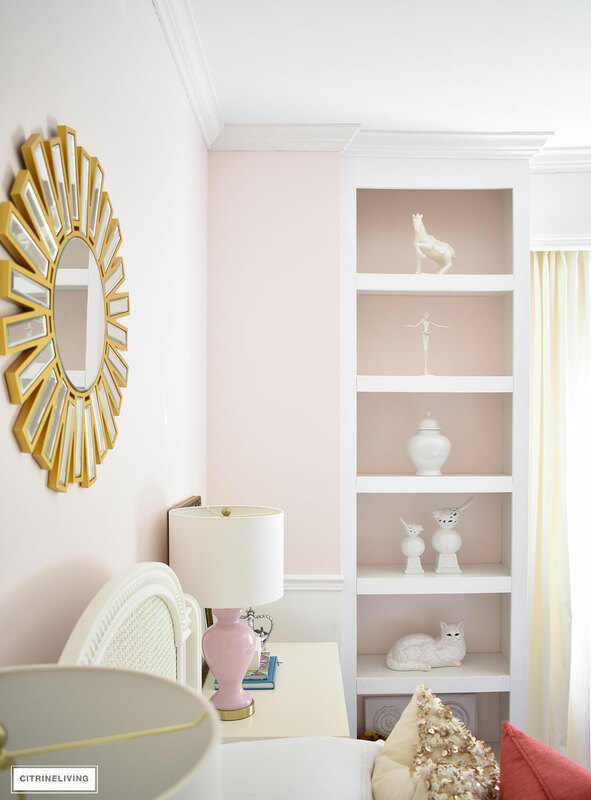 They didn’t break the bank and they make a huge difference in this blush pink and coral bedroom with brass accents. I want to thank Canadian Tire for sponsoring this post and providing the tools we needed to get this room completed! 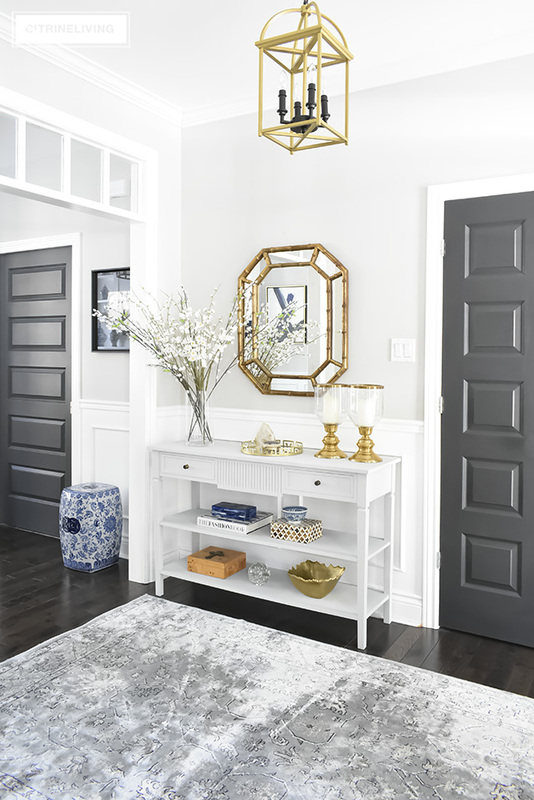 When I first set out to find the perfect blush pink, I had talked about some Benjamin Moore colors I was considering for this space. 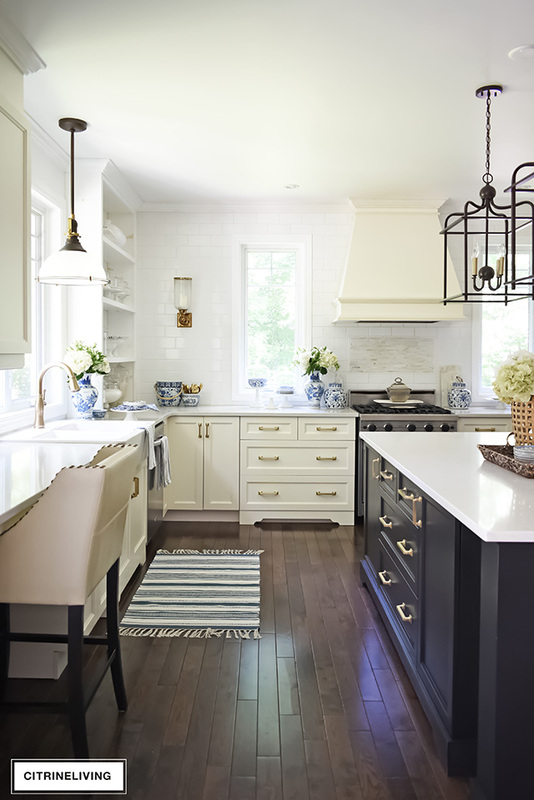 Shortly afterward, when I was approached by Canadian Tire to collaborate on a project featuring their new line of Premier Infinity Interior Paint, I was thrilled when I found the perfect blush pink wall color – Pale Peach. 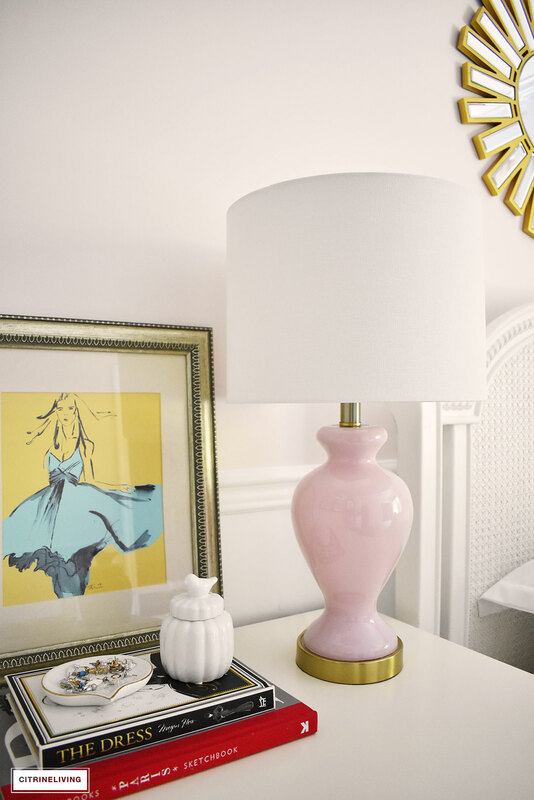 It’s not too pink, and not too peach – it’s the most delicate shade of pink that washes her room aglow so beautifully. What I really love about the color is that it makes the room feel so much larger than it actually is. This is a small bedroom, only 9 x 12 feet, and with the two previous colors, a kelly green and a pale turquoise, the room felt much more closed in. 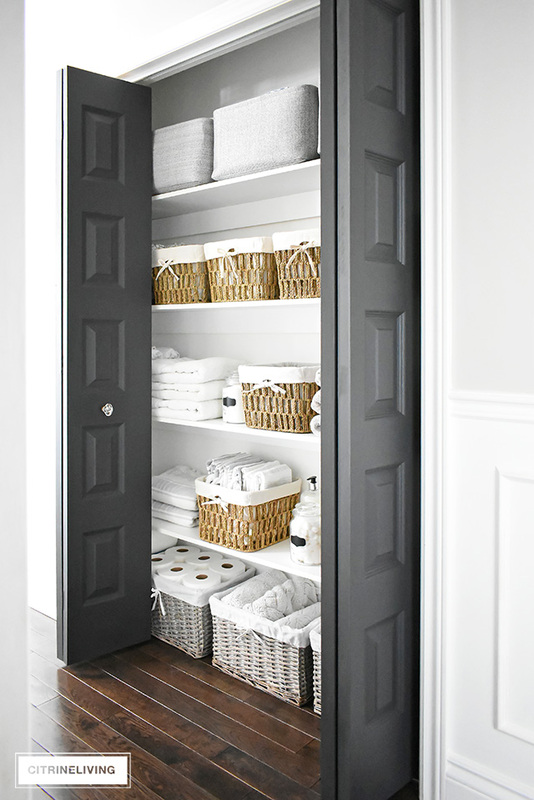 This color is light and airy, and because this room gets a ton of direct sunlight (the sunniest room in the house! ), it feels so warm and energizing. We love it! I love it haha. I’ve loved all of the looks we’ve had in here, and it’s been so fun reinventing this room without changing it completely. The quality of the paint is excellent, and for someone who has painted every home we’ve ever owned (and ever bedroom I ever had growing up! ), I can tell you, I love this paint. 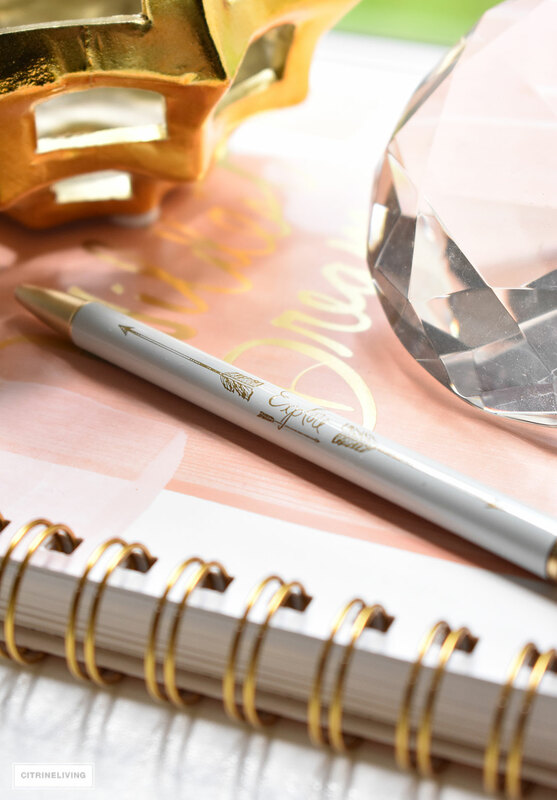 The coverage is great, it goes on beautifully and the eggshell finish is gorgeous. One of the things that has stayed consistent throughout all of the room updates we’ve done is the coral roman blind and bedskirt that my mother-in-law made. I also decided to hang up the original white Ikea Ritva drapes that used to be in here (I removed them with the last redo). I didn’t realize how much I missed them! 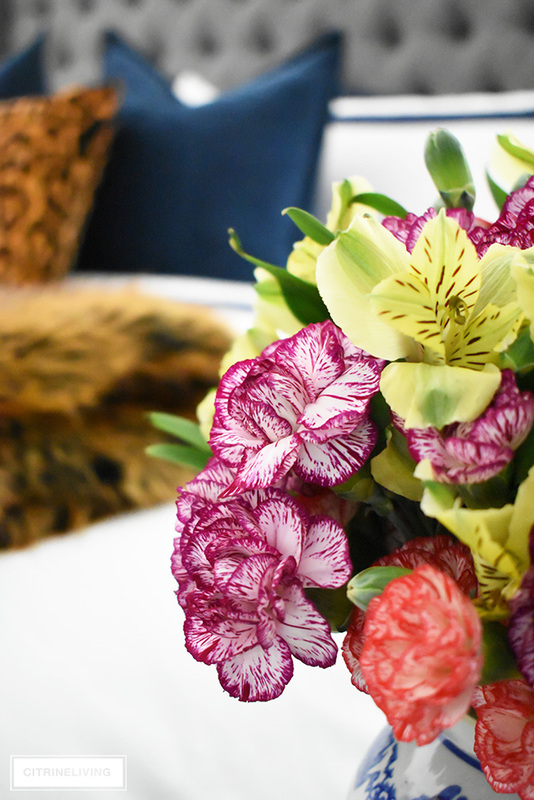 They add the perfect amount of chic and finish off the window. 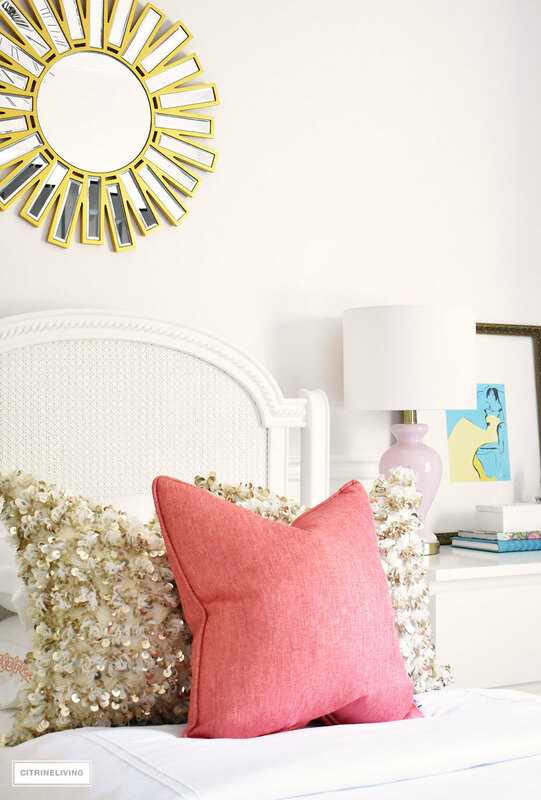 I recently found this cute brass sunburst mirror for over the bed and it’s perfect in here…just the right amount of chic for an 11 year old girl. The gallery wall with my fashion illustrations is the same as it was before as well, and I think they look just fabulous on this pale background. The perfect feminine backdrop for these girls! 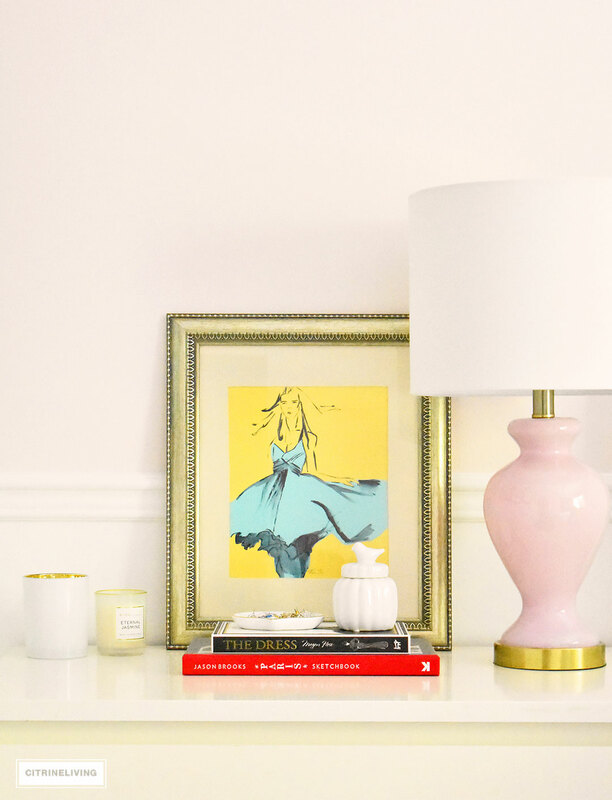 I picked up a pair of these cute pink and brass lamps to complete the look – I wish the scale was a little bit larger, but the color and shape with the drum shade is perfect, so I went for it. I think I definitely made the right choice. I love the look of the pair flanking the bed – symmetry is always a good thing! 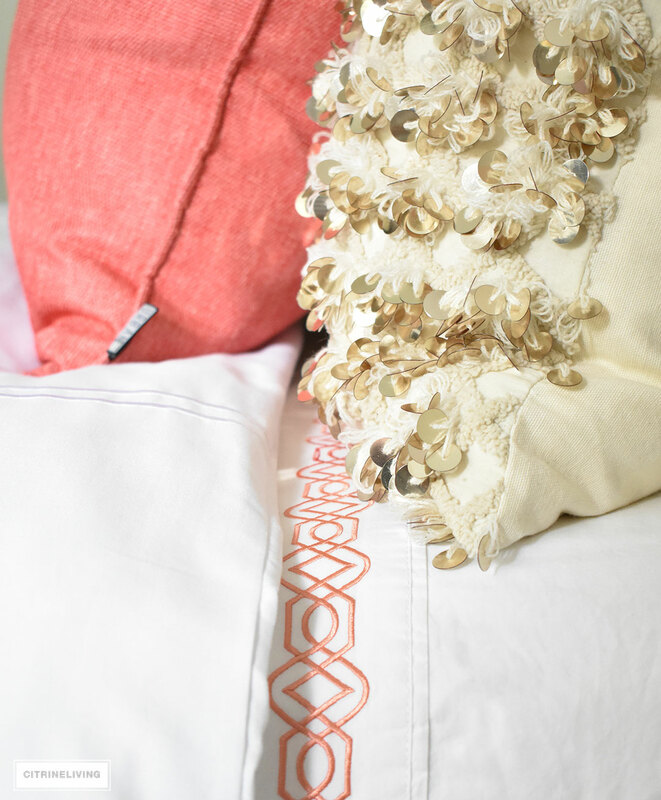 The white on white hotel bedding is simple and classic, and the sheets with the coral trellis embroidery adds just the right amount of color. I wanted the bed to be clean and minimal so the rest of the room can shine. 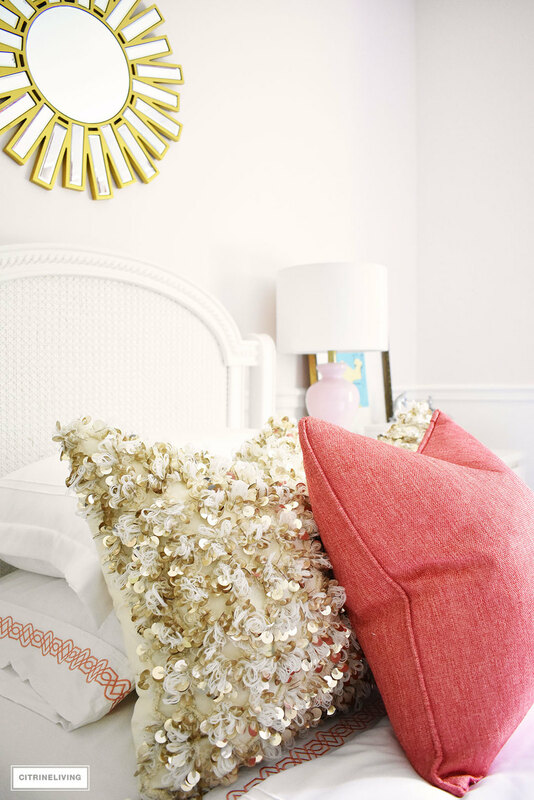 I added the gold sequin pillows that used last Christmas, and I love them layered with the coral pillow. 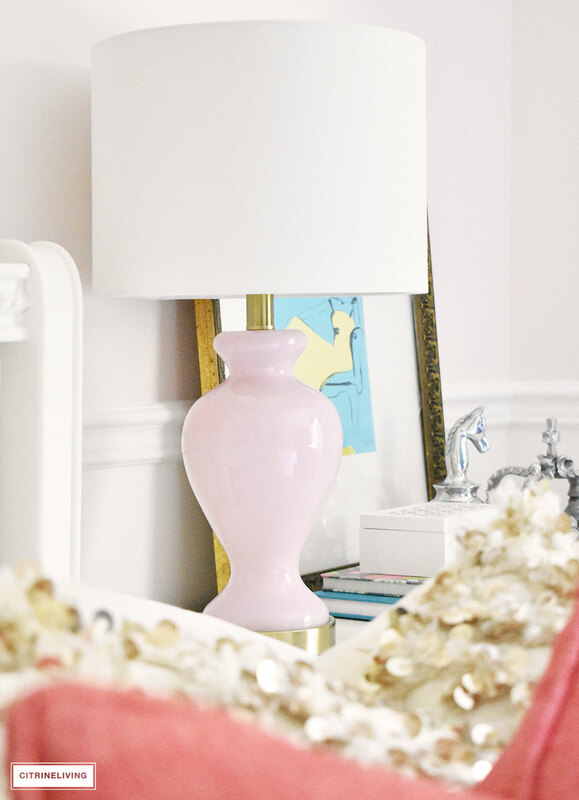 Girls’ rooms are so fun to play around in, there are so many ways to be creative and layer pretty things together. I’m loving the added brass elements in here too, it’s chic and always sophisticated. 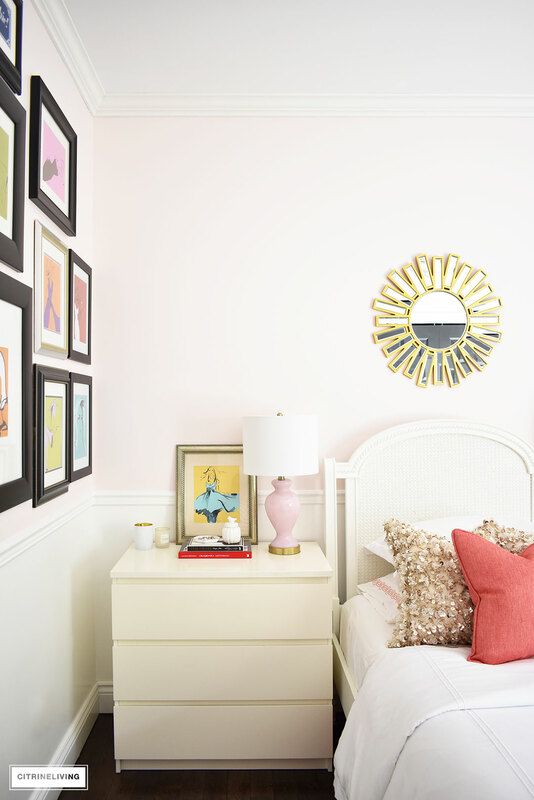 One of my drawings leans against the wall on either side of the bed, and I love the pop of unexpected color against this gorgeous shade of blush. 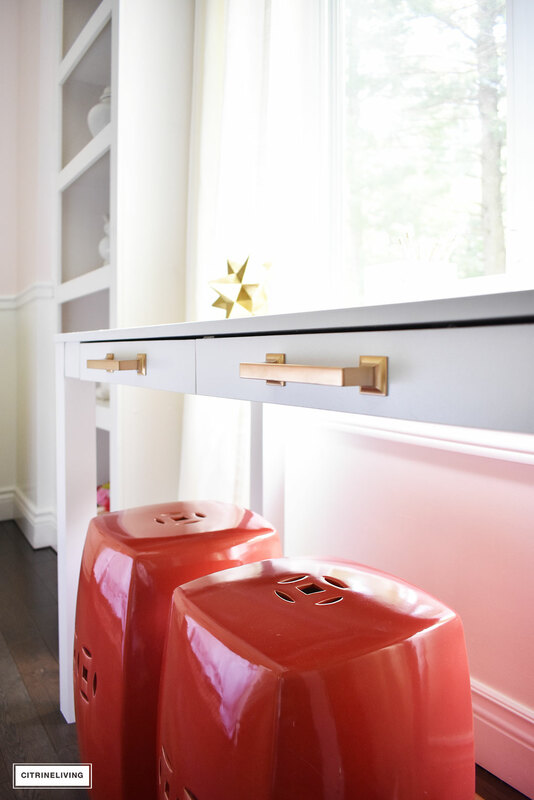 The desk was a very inexpensive find, and we added handles for a little glam and elegance. I had these ones left over from our kitchen and I spray painted them gold. The color came out a little more bronze or rosy than I wanted, but I love the way they look nonetheless. A very quick, easy and affordable way to bring a piece of furniture up a level. 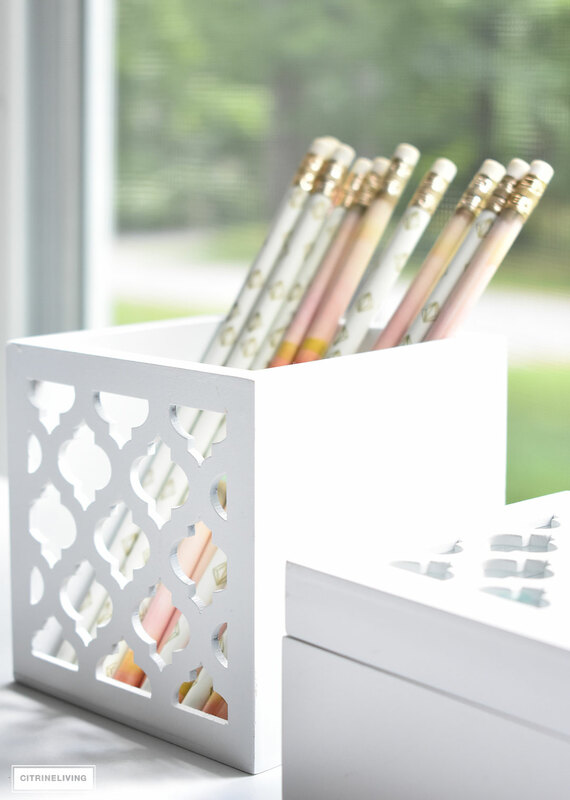 A few brass accents and desk accessories adorn the desk – I’ll cross my fingers it stays this clean! Believe it or not, this is our daughter’s first pink room and she’s eleven. It’s always been green or blue, and although they’ve all been beautiful, we wanted something that was feminine and chic. This room can grow into her teen years and I think I’ll be leaving it like this now for a little while! *I’d like to extend a very big thank you to Canadian Tire for sponsoring this post! While I’ve received both payment and free product in exchange for writing this, all words and opinions are my own. Tam! I am in love- what a different, unique color combo that you brought together BEAUTIFULLY! This makes me want to paint a light blush somewhere; I had no idea it could be so gorgeous. Bravo! Tam I LOVE it!!! It’s the perfect shade of pink for the sweetest (I’m sure:) girl!!! I love seeing this room reinvented each time but this time has to be my absolute favorite??? I absolutely LOVE that blush pink! You always make my jaw drop when I visit your room transformations Tam! Stunning!! Love it all. The perfect shade of pink and the touches of coral are such a great addition. I think pink has always been my favourite color. I started in my 20s using it all over in rooms in our condo. Then it went out of style for a good twenty years and I’m so happy it’s making a comeback!! Sydney is so lucky to have this gorgeous color with the brass!!! Beautiful! Gorgeous! The lamps would look too small in an adults room but fit perfectly for a teen. Love! Tam – the color is gorgeous and yet subtle. It’s a room Syd can grow for many years in. Very classy and timeless… as usual. That is seriously the prettiest shade of pink!! And I love how you carried it over to the back of the bookcases – looks amazing! It’s now on our “possibles” list for my own daughter’s bedroom redo! Thanks for the inspiration!